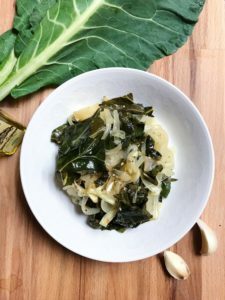 In celebration of Martin Luther King Jr. day, I decided to honor Dr. King by making one of his favorite southern dishes with my own healthy spin, Collard Greens with Truffle Oil, Caramelized Onions, and Roasted Garlic. 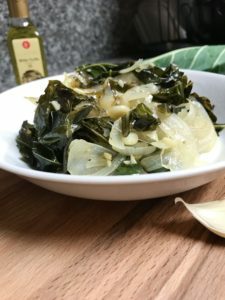 Collard greens are a cruciferous vegetable known for their cholesterol-reducing properties as well as reducing the risk of cancer and inflammation. High in ten different vitamins and minerals, including Vitamin A, K, C, calcium, and iron, this meal will be sure to help keep you healthy during this cold February month. No wonder Dr. King loved it so much. Preheat oven to 400 degrees Fahrenheit. Cut the tops of the head of garlic to expose the cloves and place on foil. Drizzle the garlic head with 2 tsp of olive oil and wrap in foil. Roast for 30 minutes. While the garlic head is roasting, peel and slice the onion, chop the two cloves of garlic, and set aside. Add the olive oil in a large pot over medium heat. Add the onions, salt, and garlic, stir occasionally, and wait until the onions turn a light golden color. While the onion and garlic are cooking, begin preparing the collard greens. Remove the collard greens from the stems cutting from the leafy ends, down. Chop the leaves into bite sized pieces. Set aside. Once the onions and garlic have reached a golden color, add the vinegar, red pepper, and black pepper. Add the collard greens and mix together. Add the water and cover the mixture allowing it to cook for 10 minutes. Stir occasionally. Once the 30 minutes have passed, remove the roasted garlic from the oven. Squeeze out the garlic from the peel. Add the roasted garlic to the collard greens. Add a pinch of salt to taste and drizzle lightly with truffle oil. Enjoy.